Discover the main features of The Pool Filter Acoustic Box. 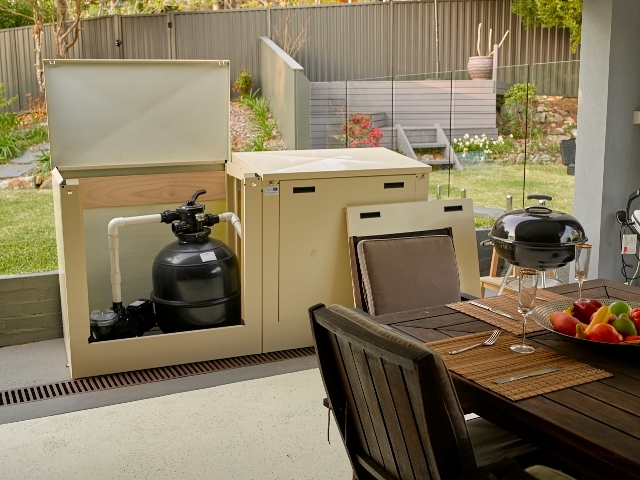 The Acoustic pool filter Box is a unique state-of-the-art designed swimming pool filter/pump cover. Assembly does not require any nuts & bolts or any special tools. It takes less than 5 minutes by someone with no previous experience in building or handiwork to assemble one of our medium sized boxes. In most cases, after assembling a number of boxes, this takes even less time!. The pool filter box is made of (0.9 mm) galvanised metal and finished with quality thick powder coating.